No longer are you left to decide between notebooks, stickers and shoelaces. Club Nintendo, for those unfamiliar, is a rewards program set up by Nintendo to reward people for buying and playing Nintendo games. 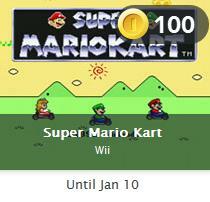 Picking up the newly released 'Fortune Street' nets you 50 coins, 'Mario Kart 7' gets you 30 and so on. Until recently, you've only been able to trade in those coins for Nintendo swag like notebooks, tote bags and fans . To be fair, you could always get a Game & Watch or two but those aren't everyone's cup of tea. Now Nintendo has introduced downloadable titles to the mix. Wii and 3DS games are in the mix including titles like 'Super Mario Kart,' 'Xevious,' and 'Mario vs. Donkey Kong: Minis March Again!' According to Nintendo, you'll get a new selection of games to choose from every month. Swing on over to Club Nintendo, register your games and grab some free downloads.